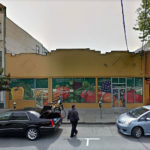 The preliminary plans for a 374-foot-tall tower to rise at 1261 Harrison Street, at the corner of 13th in Downtown Oakland, have been scrapped. Instead, Pinnacle Red Group is now pushing forward with plans for a seemingly split 460-foot-tall tower to rise on the site, the formal application for which was filed with the city today. 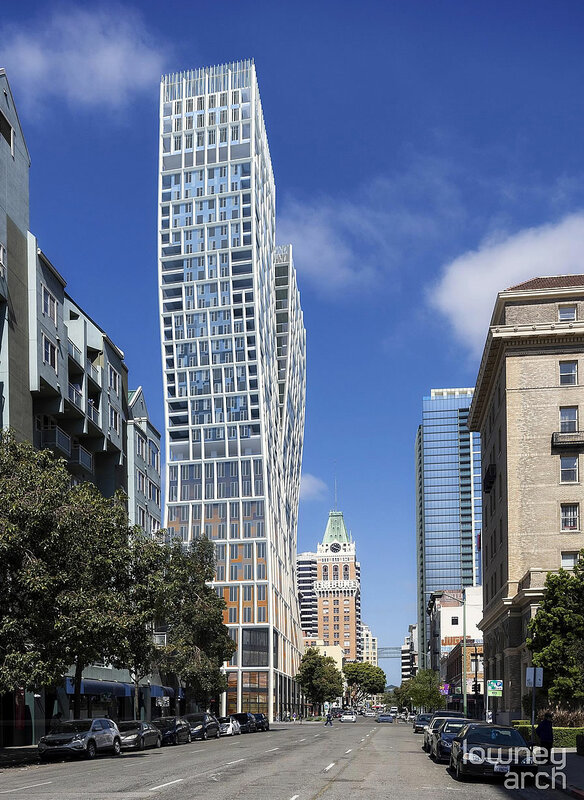 As designed by Lowney Architecture, the 36-story tower would yield 185 condos over 120,000 square feet of office space and 12,000 square feet of restaurant/retail at its base. 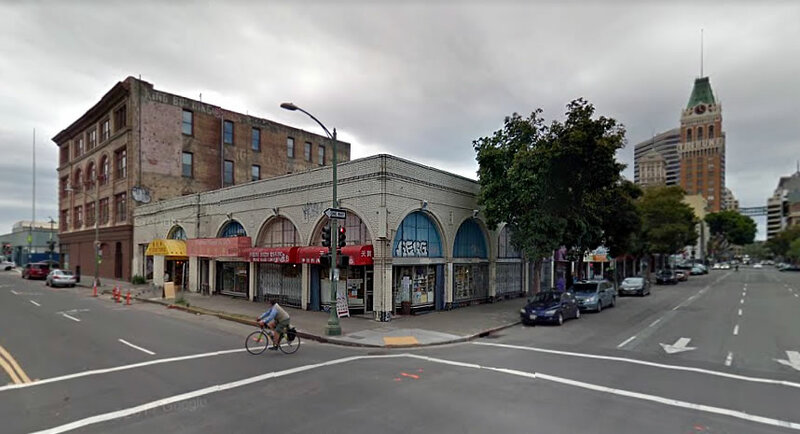 And while the site on the edge of Oakland’s Chinatown is currently only zoned for development up to 275 feet in height, the project team is planning to leverage a State Density Bonus in order to achieve the extra height for the 1261 Harrison Street tower as proposed. We’ll keep you posted and plugged-in. The last rendering is pretty neat because it includes a number of buildings that are yet to be built. Here’s approximately the same perspective in Google Maps with quite recent imagery. Wild! This is what Oakland needs. Yeah – or more like YEAH !!! – I noticed that too, but I don’t think that top most one – above the Phone Co. buildings, presumably next to the Fox – is actually being proposed…to be honest, I’m not sure when that was ever proposed, I don’t remember it. 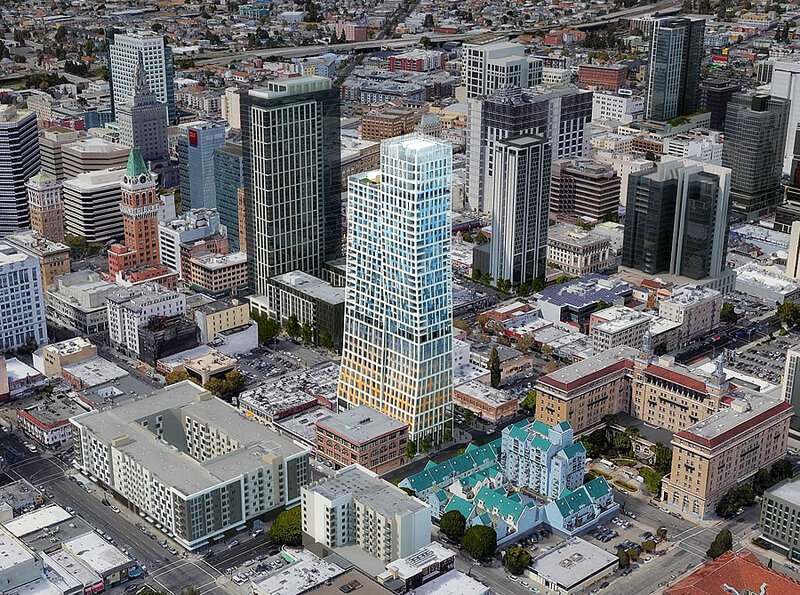 To be fair, the area shown with the future proposed highrises is currently the hole in the donut of downtown Oakland. Lake Merritt Financial District and the City Center/Frank Ogawa Plaza Area have plenty of highrises. These new buildings will bring the two highrise areas together to create a contiguous and vibrant DTO. Have any of these towers planned for Oakland in the past 20 years ever made it to the construction phase? one office tower and one residential tower are currently under construction. one additional office tower is apparently breaking ground very soon. Think that’s it, but not completely sure. You’re not wrong that many Oakland proposals have failed to become buildings. However, others have. By your loose standard even the embarrassing hole in the ground at 601 City Center “made it to the construction phase.” 1700 Webster and 1640 Broadway are currently under construction. Uninspiring , looks like it was put together with toothpicks . Oh man, love it! I’ll get my shovel and start digging. That would be cool. Add 50 more feet to the height! They’re called cities for a reason. This is a beautiful building. This will definitely be a landmark building for Oakland and for the Bay Area. I also love the repurposing of the charming brick alley way used to frame the iconic Tribune Building. Loads of character and charm. The Chronicle seems to give a lot of column inches to claiming people oppose something in Oakland (Uptown Station, the Mac Bart Project, …). Cynical people might almost believe they have ulterior motives in doing so. Let’s face it, the vast majority of the corporate media are promoters for everything San Francisco. They constantly promote SF events and give much more exposure to SF’s economic development and architecture. Anything about Oakland always comes with interjected negatives or is told in a SF-centric manner. Oakland’s NIMBYs are gonna NIMBY regardless of what the Chronicle writes. I’m not in love with the Chronicle, but it’s just the messenger. The Oakland Heritage Alliance is the one that is fighting this. The issue is who they choose to be a messenger for: there are 6B people in the world, and several thousand NGO’s, so it’s always a matter of giving a voice to a select few of them; the EBT story for example, found an entirely different set of people. That having been said, I found this particular Chron piece to be fairly balanced. I did note that it was handled by John King – the “urban design” writer – rather than a real estate writer, and one could make something of that, I suppose; but as he seemed to avoid his usual penchant for pushing freakishness, I’ll leave it alone. The OHA I find a mixed bag: sometimes useful ideas, sometimes frivolous ones….at least they don’t have their hands out, so we don’t need to second guess their motives. This is actually a recent (last 15 years or so) change from long-time Chronicle position of hating on SF itself, and having a staff composed almost entirely of East Bay suburb dwellers. 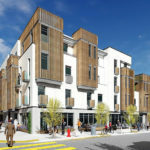 As a long time Oakland resident – 25+ years – hearkened to see buildings like this proposed – it is about time that Oakland has its day – I am a YIMBY all the way !! Yes. More interesting architecture please. This is a great building design for the Bay Area. Our architecture is generally pretty bland compared to NYC, Boston, Chicago, Seattle, etc. Wht happened to the Hotel being built on 11th accross fromEBMUD. Disgusting. Cartoon architecture should have died in the 90’s.